The Weigh Down Workshop, a faith-based weight loss program, which teaches people to conquer their addiction to food, as well as other substances and vices, by turning to God. 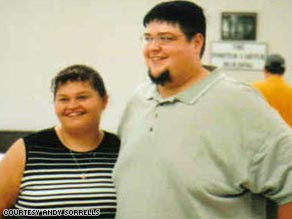 Maggie and Andy Sorrells weighed 440 pounds and 505 pounds, respectively, at their heaviest. Rite now, Maggie, weighs 140 pounds and wears a size six, and Andy, who weighs 220 pounds and wears a size 36. It's awesome. How did they do that? Weigh Down holds the keys to not just weight loss, but to ending the desire to overeat. • The Weigh Down Diet (Doubleday), written by founder Gwen Shamblin, sold over a million copies. • Rise Above, the follow-up book by founder Gwen Shamblin, takes the basic issues from The Weigh Down Diet and expounds upon them. It is equipped to facilitate the struggler. • The Weigh Down Workshop has been around over 15 years. It has been held in over 30,000 locations all over the world. • This program bridges the gap between spirituality and health; there is a spiritual link between spiritual health and addictions. Weigh Down has been a powerful tool to show the link between them. • Weigh Down is REVOLUTIONARY. It is not a diet. We would like to challenge any weight loss program to prove that it can produce more results, come up with more significant weight loss, and permanent weight loss than those of the Weigh Down Workshop. It does not change the food; it directs behavior modification toward the heart of man. • THIS IS THE GENUINE ARTICLE. It deals with the root problem - the heart. We lovingly work with the heart and the genuine desire not to overeat. Andy, like Maggie, tried countless diets but failed to keep the weight off. At his heaviest, he was 505 pounds and had to have most of his size 64 clothing made by his mother to fit his 6-foot-3-inch frame. Remnant Fellowship / Weigh Down Ministries....Condones Murderers by posting their bail so they may not have to pay for BEATING their son to death. Their con artist who also beat children with glue sticks. How much money have you GIVEN to the Shamblins? That sure is a nice 2.3 million dollar home she lives in. Tell me this...Does God where a Rolex? Its nice people are losing weight, but twisting the Bible to fit your agenda is discusting and I hope you enjoy your life well. Because when you do come before God, I have a feeling your on a ONE WAY trip to Hell. Have a nice day.